This recipe is from RoostBlog, again. I already had all of the ingredients at home, so it was just a matter of making it. Double the recipe if you’re using 9-in tart pan (that’s what I did). Preheat oven to 350. Combine the dry ingredients then add in the wet. Mix together then press the dough into the pan with wet finger tips. *Spray pan with grapeseed/olive oil to help them come out easier*. Bake for 15-20 minutes. Take out, and let them cool for a half an hour (I just left the crust in the pan the whole time, even when I added the filling). Heat olive oil in a deep skillet over medium-high heat. Add the onion and cook until the onion is soft and translucent, about 8 minutes. Add the chard stems (you will add the leaves later) and chopped rosemary. Cook for 7-10 minutes until the stems are tender. Add the garlic and cook for another 30 seconds or so. Add the chard leaves. Cook until the leaves are wilted and soft and any liquid has evaporated, 7-10 minutes. Remove the pan from the heat and let cool. Beat together the eggs and season with salt and a pinch of pepper. Add the cooled chard mixture and feta. Mix well and scrape the filling into the prepared shell(s). Bake for 20 minutes (at 350). Remove and serve with a drizzle of balsamic. This sounds awesome! 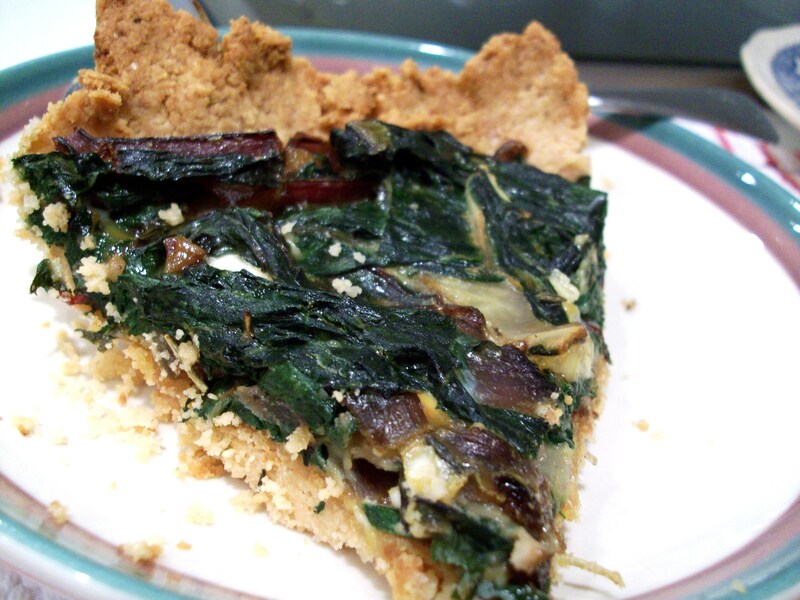 I love chard and that crust must be delicious. It is! The crust is kinda crumbly, but is manageable when it’s completely cooled.